Charles Anderson was appointed in 2008 to finish three years of a four year term and then elected in November of 2011. 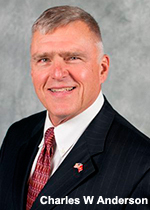 He is a retired Colonel from the US Marine Corps and has served in leadership roles in a number of local government organizations since returning to the area. He is a carrier qualified, rotary and fixed wing pilot and enjoys many outdoor activities such as climbing and hunting. He has been married to Nancy for 40 years and has 3 children and 5 grandchildren. It is the responsibility of the Westmoreland County Commissioners to execute contracts for the various departments throughout the county for the purpose of conducting necessary services. They strive to represent the residents of Westmoreland County with the best services that a prudent budget can provide while keeping an eye on the future and planning in a fiscally responsible manner. The Commissioner's Office oversees the services provided by the county such as County Parks, Westmoreland Manor and various human services. They also provide a leadership role in the administration of the Prison and Juvenile Justice Center. Commissioner Anderson is available by phone or email and welcomes your questions or comments.